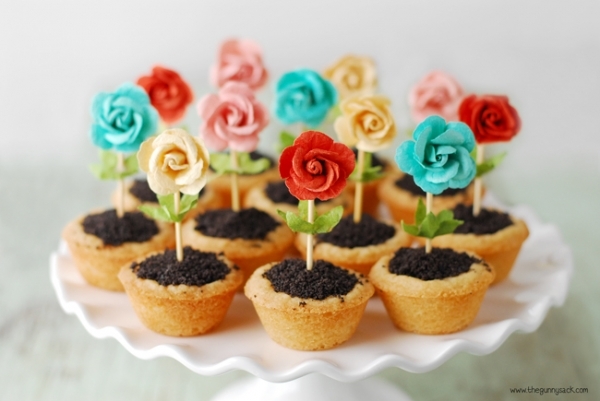 Easy Mothers Day Flower Pot Cookies GREAT IDEA! Grease a mini muffin tin, separate Pillsbury sugar cookie dough into the 24 pieces and put one into each cup. Gently press the center with your thumb to make and indentation. Bake at 375 degrees for 11 to 15 minutes, until golden brown. Use the rounded back of a small measuring spoon to make an indentation in the cups if necessary. Leave the cookies in the muffin tin and allow them to cool completely. Carefully remove the cookie cups from the muffin tin. I used the tip of a thin knife to gently pop them out. Bring 1/2 cups heavy cream to a boil. Pour over semi-sweet chocolate chips. Allow them to sit for 3 minutes and stir until smooth. Fill the cups with chocolate ganache. Crush Oreos in a food processor or food chopper and sprinkle over the chocolate ganache. Add a flower cupcake topper.